One of the apps I have on my iPhone is CNN. Today as I was sitting at school, I kept getting updates from CNN.com regarding the situation in Boston. Normally, I don't pay attention to updates...I try not to look at my phone during school hours as to not set a bad example, but they kept coming in on my home screen, where I can see them without using my password...more and more updates. I finally had to look and find out what was going on. Two explosions at the finish line at the Boston Marathon. "Wow! "...was all I could think. I have walked a marathon (or two) and after a long 27.2 miles, you are exhausted, yet elated that you are almost there. I can't imagine being yards from the finish line and a deafening, street rocking explosion occurring. Why? Then a mere 12 seconds later another explosion...chaos, screaming, why? Why did this occur? What was the meaning? If someone wanted to make a point, stand for a cause, whatever...it has been lost on the injured and dead. It is meaningless...An 8 year-old child was killed, probably standing on the sideline waiting for his parent to cross the finish line...ready to cheer loudly as the amazing accomplishment. Hundred of others that were waiting at the end, innocents ready to cheer and celebrate. Why? What was the meaning??? There is none...only eons and eons of meaningless. As I got the updates, I began to worry. There is a boy with the same disease as my son, who lives in Boston, who has runners that do the marathon as part of a partnership program. There have been many years that he has been at the finish line with his parents...thankfully he was not there today. Thankfully his runners were unharmed and they had finished before the explosion. They were running for a purpose to raise money...their run had meaning, the explosion? Meaningless. I am at a loss...earlier I was feeling frustrated that my students weren't engaging, I sent an email that I might get in trouble for, I was looking at my own small world and lamenting over my own minuscule issues...only now to realize that really these issues are meaningless. In the big picture of life...where life was literally on the line our problems are nothing, meaningless. Sometimes our life has meaning, sometimes we know our direction, sometimes nothing....sometimes we have to find the meaning in things that occur that are meaningless. Lives are valuable, but some people are bad. There were small victories today, people who came and helped, people who were there, tearing away the barricades to get to victims...people in Boston who have opened their homes to victims that are stranded, people of Boston joining together telling those bad, horrible people that they have not won...they refuse to be meaningless, but rather rise up, and boldly yell, "We are a place of meaning, we have power, we will not be halted....we are meaningful!" 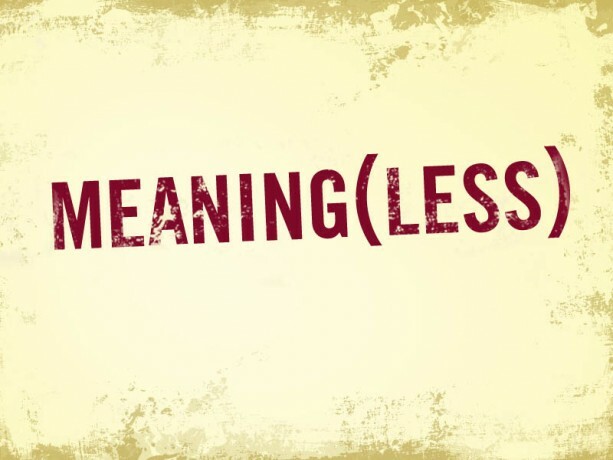 There are so many things in this life that a meaningless. Great word for today. This is a kinder word than many that have been used. It was senseless. To find meaning in something that has little we can comprehend is a great gift. It is one I try to practice and instill in my children. It has seen me through many a dark night. Yes if we can find meaning or provide meaning from this horror it is the best revenge. We always come together after such a tragedy maybe we can keep that spirit going! We can give meaning to the meaningless, just as you post; those who risk their own lives to rescue the injured, who open their homes to the stranded, who say, sorry, your hate won't make me into a hater. I can't quite wrap my mind around tragedies of this magnitude. The fact that so many people respond with a desire to help is perhaps the only silver lining in a very dark cloud.